The Orange Card is a leading Australian drug education and awareness platform; an online learning tool that is designed to tackle the growing illicit drug problem we are seeing in Australian workforces. The aim of the Card is to first and foremost educate people on the dangers of using these drugs and the impact they have on our workplace and community. With awareness comes the ability to make better choices and spread the word to the wider community – early intervention and education are key. This course has also been developed to keep employers and employees protected. 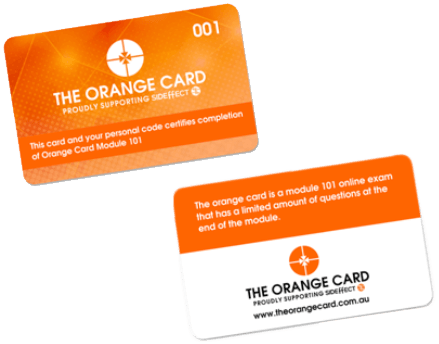 The innovative team at The Orange Card have developed the course into ten easy modules, designed to get to the point quickly and clearly. The ten areas covered in The Orange Card are: Methamphetamine, Marijuana, Cocaine, Heroin, MDMA, Research Chemicals, 25in BOME, Synthetic Cannabis, Fentanyl, and workplace responsibilities and safety. These drugs are the strongest areas of concern for employers around Australia. The Orange Card will continuously evolve as new drugs take a grip on Australian workforces and the team will endeavour to keep Australian employees and employers educated and aware. Drug awareness in the workplace is becoming increasingly necessary. Completing The Orange Card will ensure that you are staying ahead of the pack. As more organisations commit to a drug free workplace, contractors and sub-contractors will benefit from the adoption of The Orange Card by proving your commitment to provide a drug free workforce for your clients, and a safer working environment for your employees. by takingThe Orange Card course today. Sideffect is an Australian not-for-profit organisation that is dedicated to the early intervention and education of illicit dugs. With a focus on reaching Australian schools with their powerful message, the Sideffect team are also helping parents, regional communities, and at-risk workplaces. “Our mission is to educate everyone in Australia about illicit drugs (including ICE) – what’s in them, what they can do to you, and how they can affect your family and community – so that people are able to make informed decisions based on knowledge and awareness, not misinformation and ignorance.” Sideffect team. Following the death of his beautifully talented and generous son, Preston, Rodney Bridge began Sideffect. Preston died at the age of 16 after taking a synthetic form of LSD which Rod later found out was made up of 25inBome as well as a shopping list of other synthetic drugs. Preston lost his life that night based on one choice and had he known what he was taking, he would have made an entirely different decision. Sideffect was born out of that understanding, that people need to know more about these drugs in order to make informed choices. Go online to read more about Sideffect and book a visit to your school, community group, or workplace. The Orange Card training was very well received by our team and apprentices, many of whom said it provided them with a greater understanding of the deadly ingredients used in the production of synthetic substances. I am pleased to announce that effective as of the 1st February 2018 the Duxton Hotel will officially introduce The Orange Card as part of its compulsory accredited employment check for all of its future employees. I encourage all business leaders to embrace this wonderful initiative and make a difference in the lives of others. Address: Suite 11B Barker House 49 Hay street Subiaco, WA 6008.